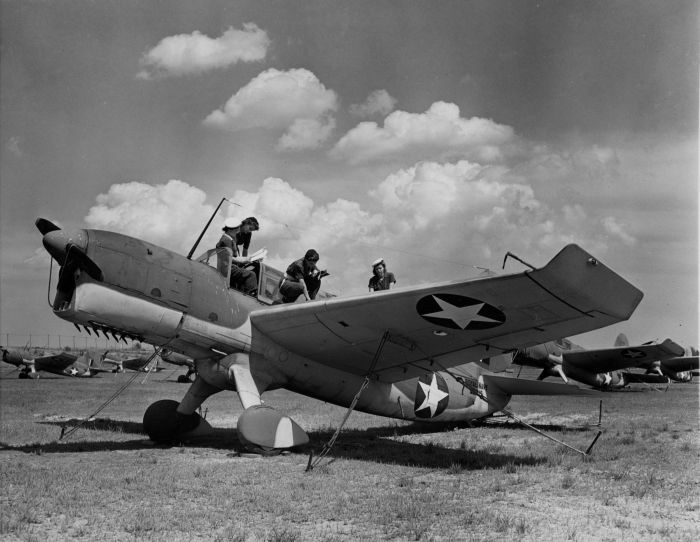 A new Curtiss-Wright P-40 Warhawk has its .50 caliber machineguns test-fired outside of the production plant. 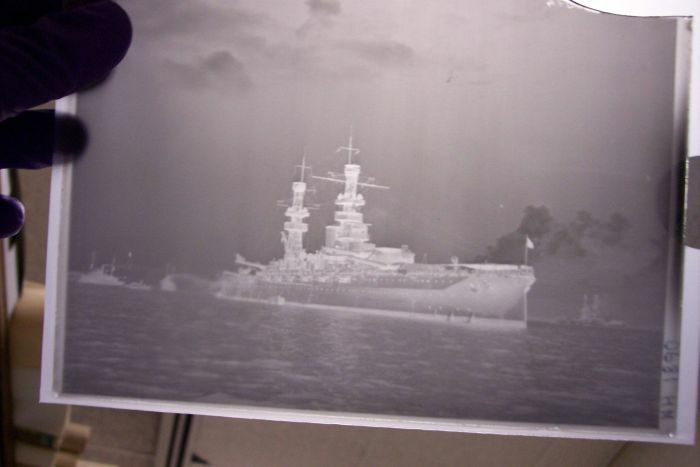 Time period is WWII prior to the Battle of Midway. A big project was to rehouse a large number of oversize prints, some up to 6' long. These were very popular in the first half of the 20th century. 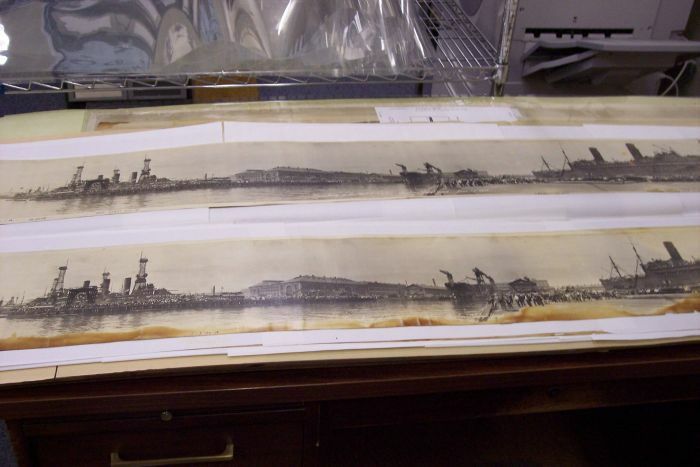 Another major project was to inventory an uncatalogged collection of several thousand glass plate negatives and slides. So cool. 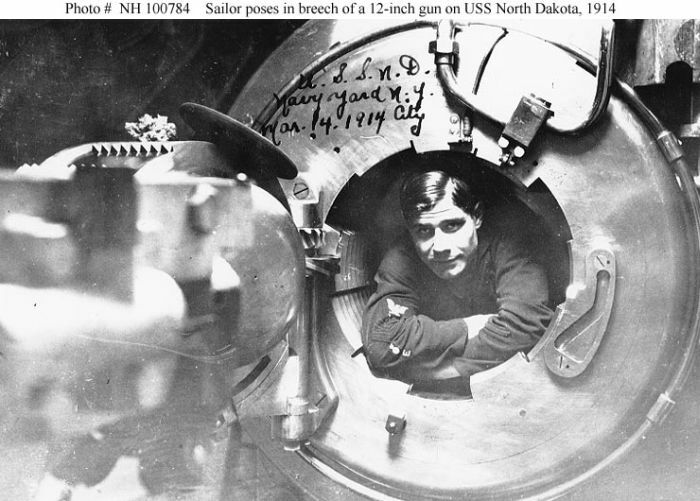 A copy of a famous picture in the National Ars. 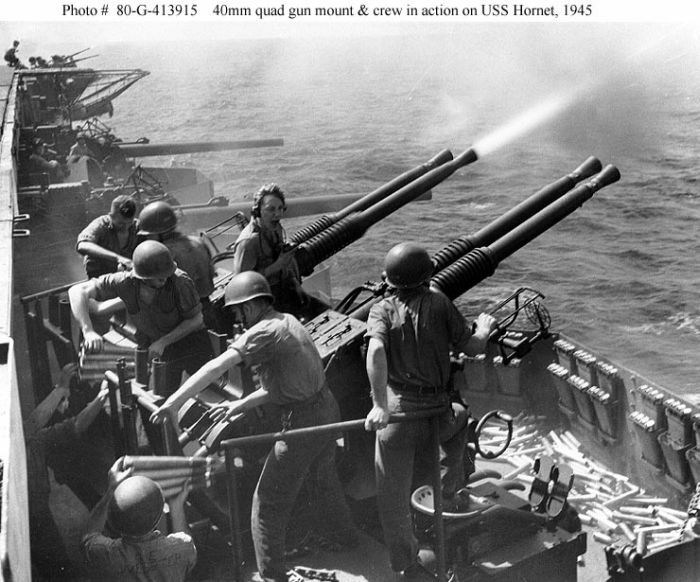 It shows some of the intensity of fighting ka:(mikaze attacks. 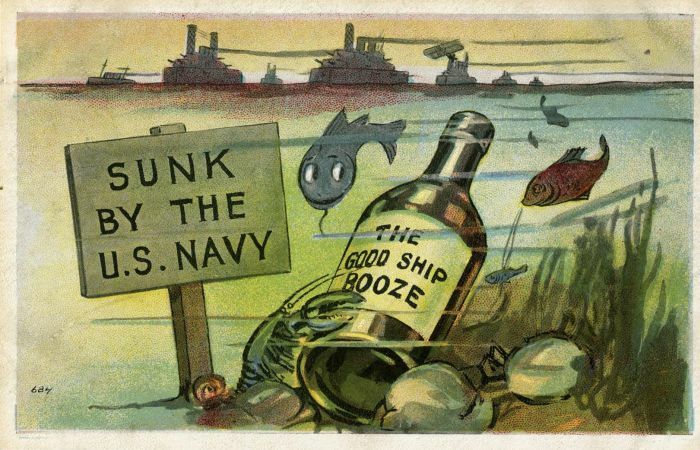 This postcard was produced after Secretary of the Navy Josephus Daniels banned all alcoholic beverages on Navy ships in 1914. 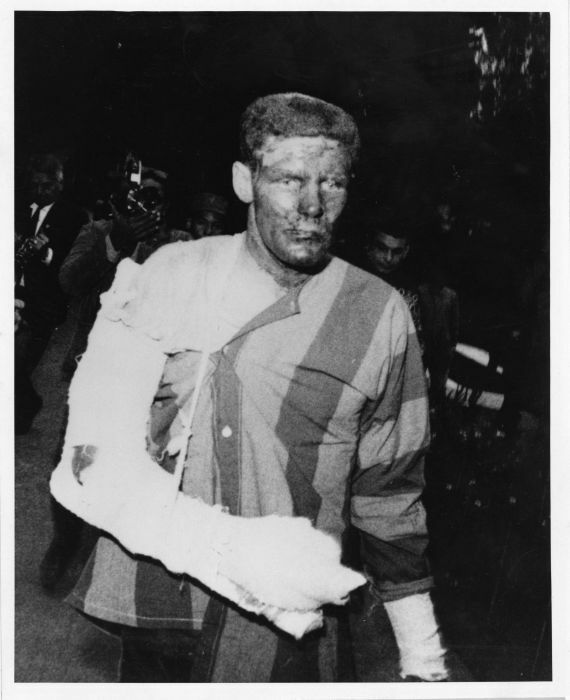 Lt. David Rehman being paraded for the Communist press after being shot down over Vietnam in 1967-68. In 1954-55 the United States evacuated over 300,000 people from Hanoi to Saigon after the partition of Vietnam into North and South. 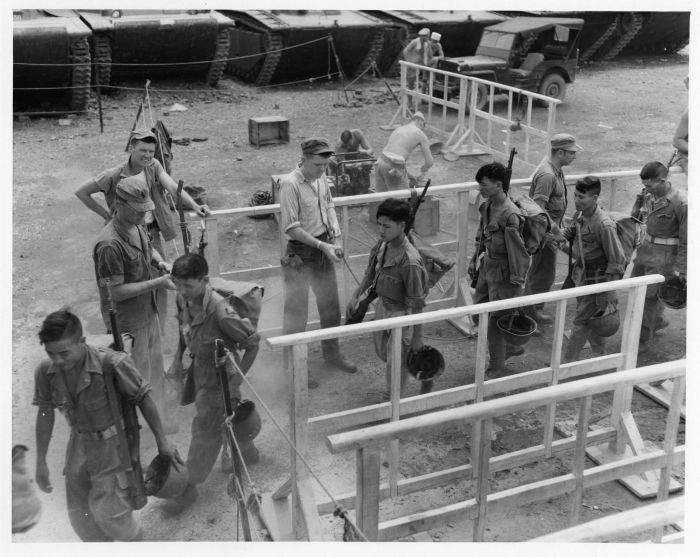 Here, Vietnamese personnel are sprayed with DDT to prevent the spread of insects/parasites. 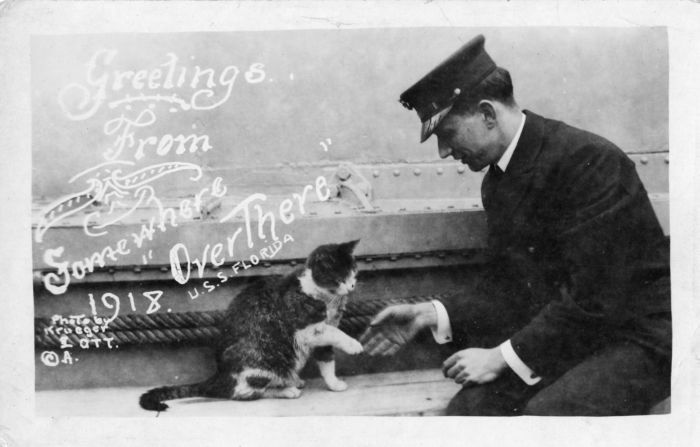 A postcard from 1918 that reads "Greetings from Over There" from the battleship USS Florida. 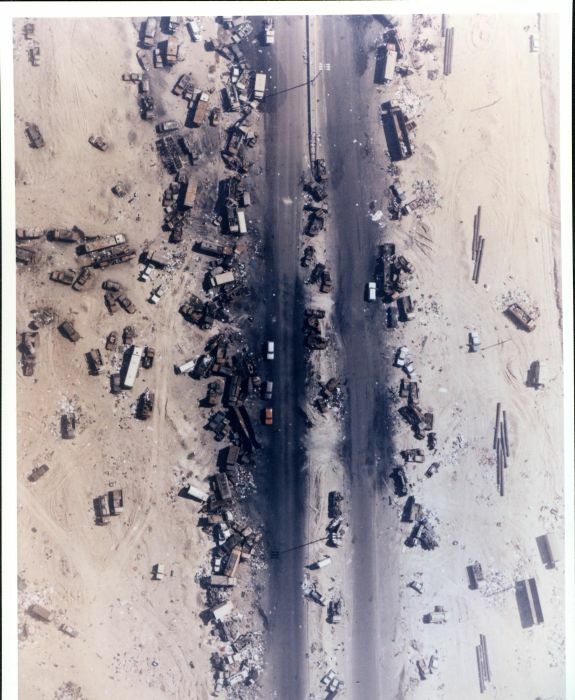 The aftermath of Coalition air strikes on a highway full of Iraqi vehicles in the 1991 Gulf War. 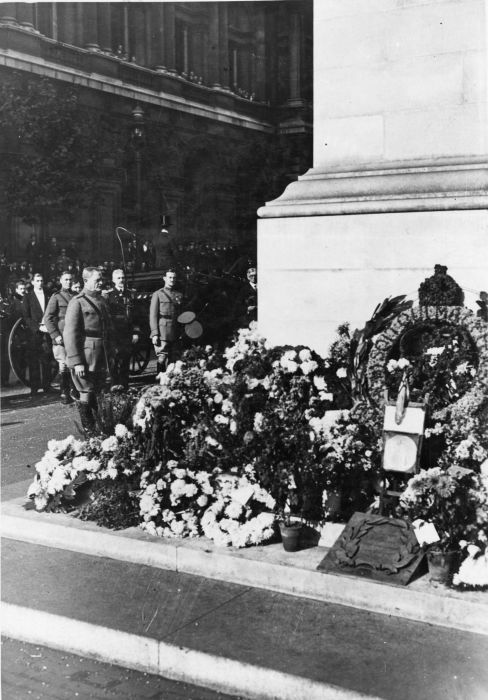 General John J. Pershing pays his respects at the Tomb of the Unknowns in London, England in 1923. 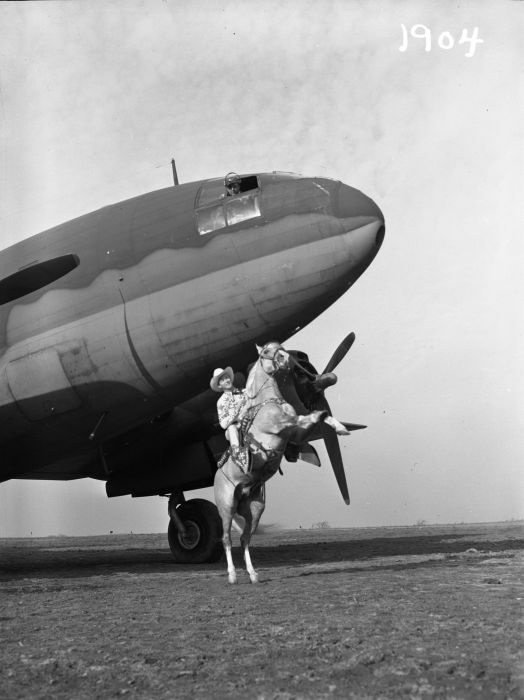 Roy Rogers and Trigger pose in a promotional photograph for the Curtiss-Wright C-46 Commando. 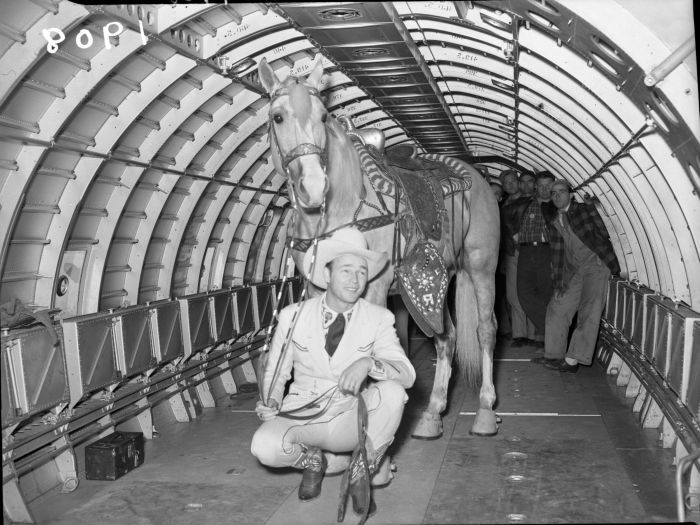 Roy Rogers and Trigger posing inside the C-46. 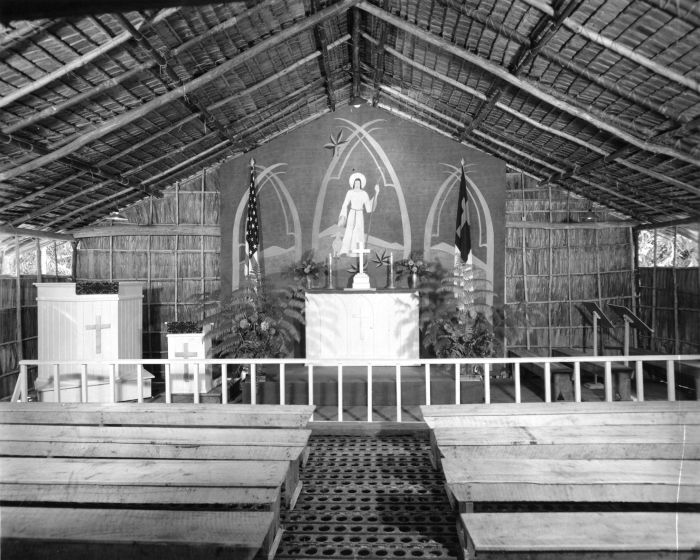 A chapel built by U.S. Navy Seabees on an unknown island during WWII. 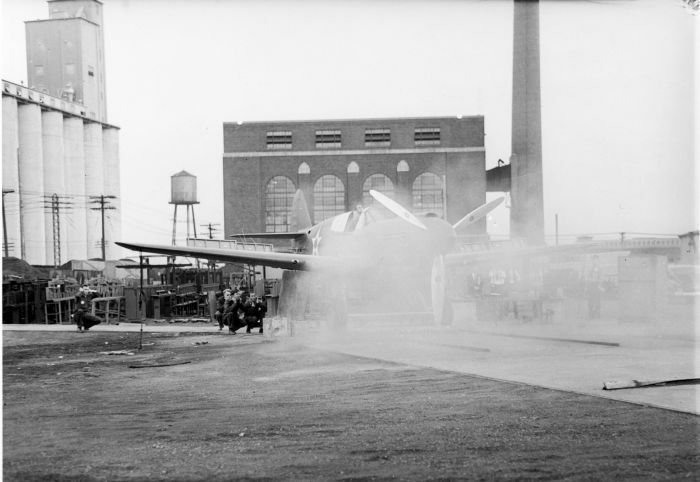 Note the metal planking for flooring that was normally used to build runways. Women from the Women's Royal Naval Service (WRNS, commonly called WRENS) inspect a Curtiss-Wright SOC-3 Seamew marked for shipment to England. 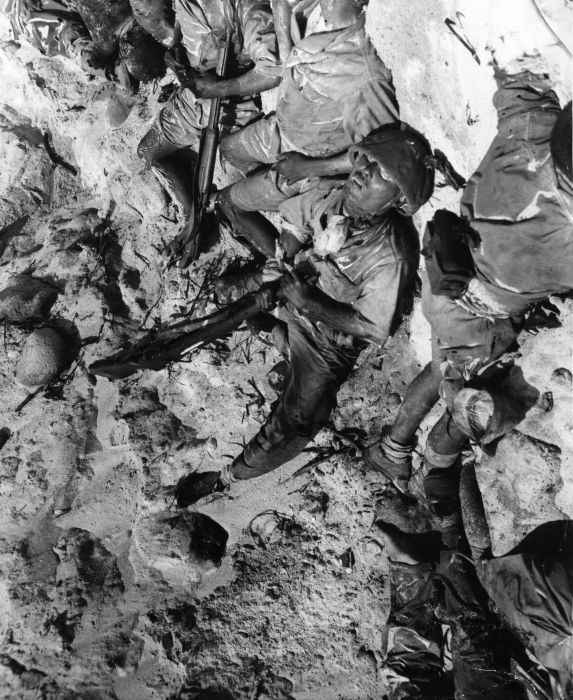 The corpse of a WWII Japanese soldier whose big toe is still on the trigger from when he committed suicide. 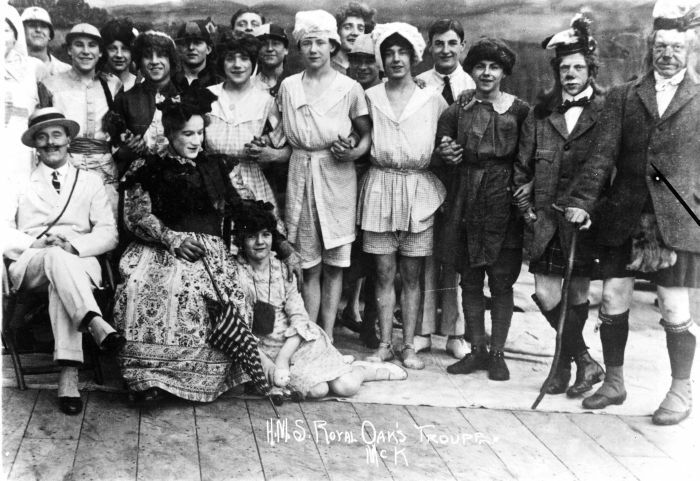 The ship's troupe of HMS Royal Oak, probably during the 1910s. 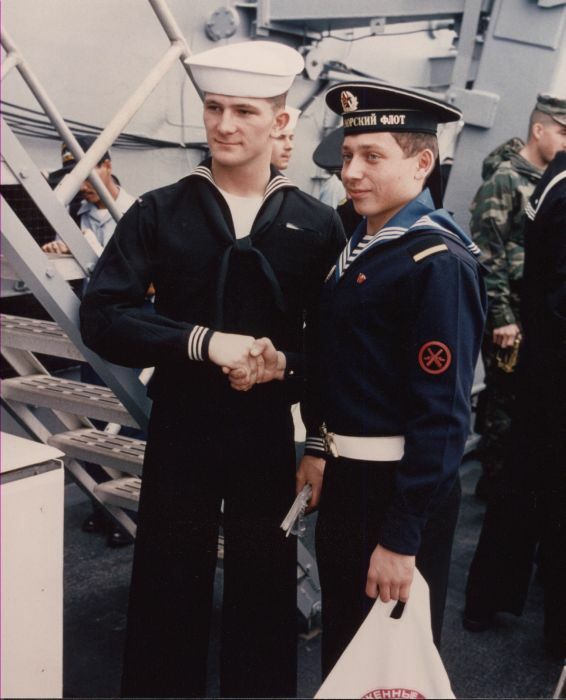 A definitely staged photograph of a U.S. and Soviet sailor shaking hands, 1980s. A company of sailors from USS Pecos enjoy some time ashore in China in 1936. 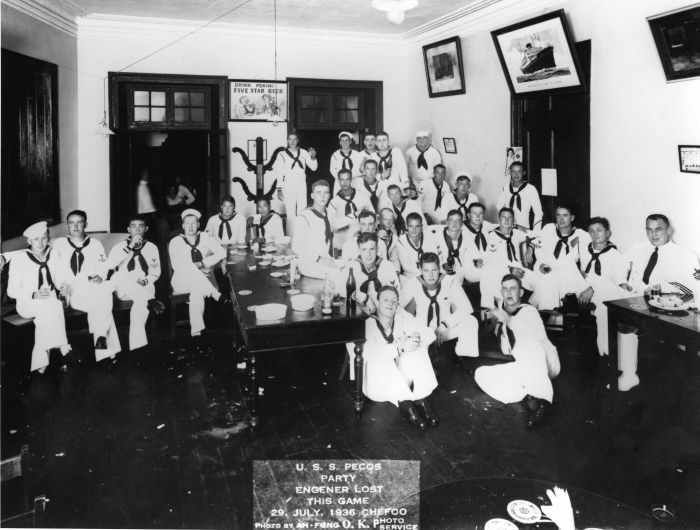 Note the sailor near the front with his left arm on the table and a bottle right in front of it. Men who had their neckerchiefs tied widely in this way often did so to conceal weights. Their neckerchiefs then became effective weapons for barfights. 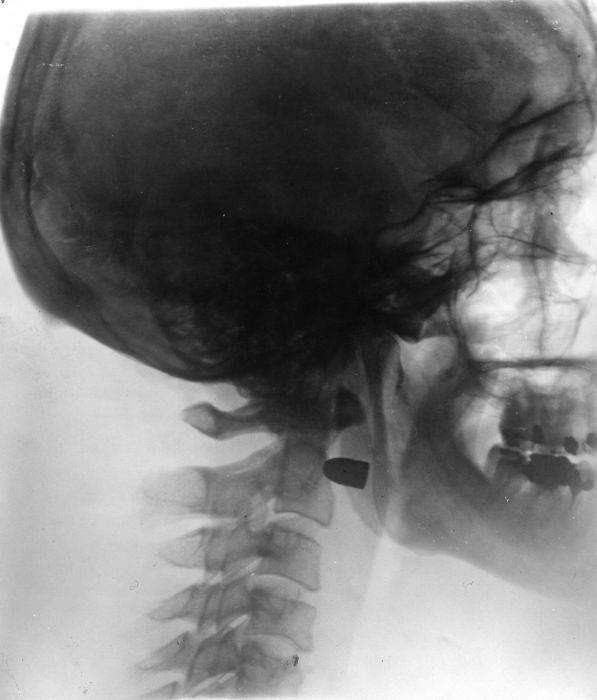 An x-ray image of a bullet lodged in the neck of a U-boat captain who attempted to commit suicide after being captured. The bullet was successfully removed by a U.S. Navy surgeon.